Aquarium Movies sasuaqu.blogspot.jp Description of Fish( language：Japanese) ヒメコダイ sp. Chelidoperca sp. スズキ目スズキ亜目ハタ科ヒメコダイ亜科ヒメコダイ属 to http://sasuaqu.blogspot.jp/2015/08/chelidoperca-margaritifera.html 三津シーパラダイス　Mito Sea Paradise This fish was exhibited as the cabbage (Chelidoperca margaritifera), but very similar to the new species Chelidoperca tosaensis. Chelidoperca tosaensis is the newest fish to be described from Japan, but what exactly is it? This isn’t such an easy question to answer, as we’ll soon see. 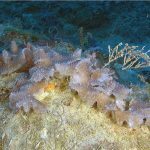 The obscure little genus to which it belongs now consists of ten species spread across the Indo-Pacific, all of which are restricted to fairly deep waters (50-300 meters). And though they look remarkably like sandperches (Parapercis), they are, in fact, members of the grouper family Serranidae. This is where the plot thickens… The serranids have traditionally been broken up into three main lineages. 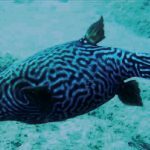 The largest species are found among the epinephilines, which includes your groupers, basses, hinds and lyretails, as well as the soapfishes and the Liopropoma basslets. Next up are the serranines, which aquarists will know from the Serranus basslets and the Hypoplectrus hamlets (both primarily found in the Atlantic). Finally, there are the various anthias and perchlet groups in the Anthiadinae. But how Chelidoperca fits into this tripartite classification is still a bit of an open question. 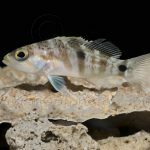 Though parts of this family have been well-studied, on the whole, the evolutionary history of the serranids is still incompletely known, and this is especially true for Chelidoperca. Morphologists have suggested the group might have arisen early on among the Serraninae, though the evidence for this is ambiguous at best. Meanwhile, genetic data to support this is still entirely lacking. I’ve included a phylogeny here (color coded, for your viewing pleasure) based on the mitochondrial CO1 gene, and it is, remarkably enough, the first time this group has ever been included in such a study. This hints at the possibility that Chelidoperca represents a distinct fourth lineage within the family, but more data is needed to confirm this hypothesis. Unlike most of the serranines, which tend to be either hermaphrodites (Serranus, Hypoplectrus) or have the sexes distinct (Paralabrax), Chelidoperca species are protogynous hermaphrodites. 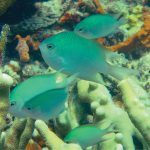 This is the same reproductive strategy we find among anthias and groupers, which perhaps hints at a close relationship for these disparate lineages… but, again, we don’t really know. About all we can say definitively is that this group is only a distant relation to Plectranthias, despite both groups being known commonly as perchlets. I would argue that we could use some better nomenclature here. Anyways, as if things weren’t confusing enough, the newly described C. tosaensis has actually been known for quite some time under a different name, C. margaritifera. However, careful study revealed some pretty significant morphological differences with that species, which is now thought to be limited to Indonesia. C. tosaensis is thus far known only from Japan and the Philippines, mostly from depths in excess of 60 meters (though it has been spotted as shallowly as 11 meters). 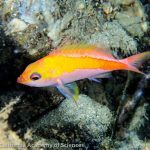 The scientific name derives from Tosa Bay in Japan, which also gives the anthias genera Tosana and Tosanoides their names. The Red-spot Perchlet grows to at least 9 cm and can be identified by its yellow-spotted fins, blotchy red body, and the bright red ocellus on the opercular membrane. Aquarium Movies sasuaqu.blogspot.jp Description of Fish( language：Japanese) ヒメコダイ　Chelidoperca hirundinacea スズキ目スズキ亜目ハタ科ヒメコダイ亜科ヒメコダイ属 三津シーパラダイス　Mito Sea Paradise Copyright © 2014- Sasuke M Tsujita All Rights Reserved.